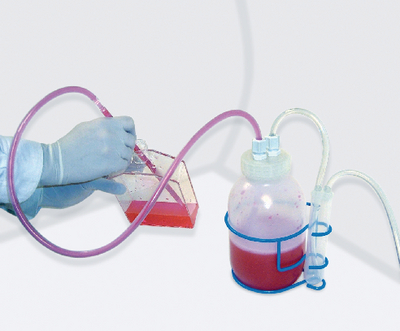 This Vacuum Aspirator Bottle is a useful tool that makes it easy for any lab to cleanly aspirate and collect fluids from containers such as Petri dishes, microtiter plates, flasks and centrifuge tubes. This simple to operate system includes all the parts (except a pipette) to connect to a vacuum pump or house vacuum source for continuous aspirating of tissue culture media, wash solutions, supernatant fluids after centrifugation, chemical waste, etc. The Aspirator Bottle safely retains up to 1500ml (48 oz.) of fluids for proper disposal and the attached trap protects the vacuum source from accidental fluid backflow. The small footprint of the epoxy coated steel wire cage securely supports the collection vessel and secondary vacuum trap without crowding workspace.